Quail Egg Santa Bento, a photo by sherimiya ♥ on Flickr. OMG, that is the cutest Christmas bento I've ever seen!! you're AMAZING!!! Ho Ho Ho.. I am so loving this... cant wait for Christmas to come! Christmas break, yeah! Waiting it more than Santa :P.
I love the mini quail-egg santa!! It's super cute and love the contrast of the black rice too. 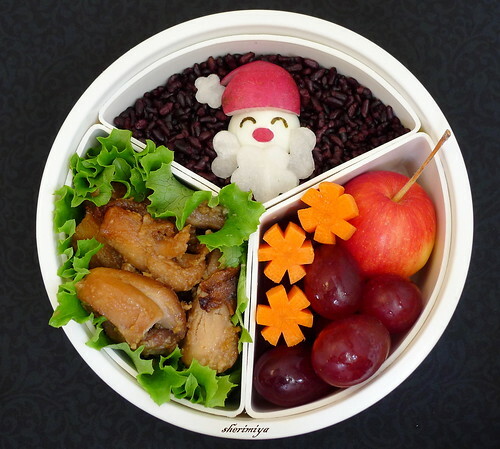 Great Xmas-themed bento, Sheri. Looking forward to seeing more :D)! I'm excited to see your Christmas theme bento! This santa is cute one to start with!